The 2018 public engagement awards were an opportunity to celebrate the efforts of our community who engage diverse audiences with their research. Testing ideas by inspiring children with science, gaining feedback by involving key stakeholders and staying motivated by sharing findings and interacting with the wider public were all cited as important reasons for doing public engagement by finalists at this year’s Vice-Chancellor’s Awards for Public Engagement with Research. The annual awards, a showcase of the best in public engagement from researchers across the University including PhDs, is an opportunity to share how and why public engagement matters, to demonstrate how it can improve the quality and impact of research and provide examples of good practice. At the event, held recently on campus and organised through the Public Engagement Unit, four finalists were challenged to engage the audience about their research in a captivating and entertaining way, using just one prop, image or slide and to do so in no more than six minutes. Those attending heard from Bethan Charles, Caroline Hughes and Annaleise Depper, PhD students from our Centre for Sustainable Chemical Technologies / Department of Chemistry, Department of Architecture & Civil Engineering and Department for Health, respectively. Bethan’s PhD is focused on next generation solar cells – known as perovskites – and their potential to transform solar energy generation, including by being incorporated into everyday objects such as walls and windows. Her public engagement activities have included establishing a Bath in Science Policy group here at the University, working with local teenagers on science projects through BRLSI, and managing the ‘Atoms to Galaxies’ section of the popular Pint of Science Festival. By 2050 a quarter of the UK population will be aged 65 or over. Presently around 9,000 more people over 65 die each year due to health problems worsened by cold homes. Caroline’s research is the first longitudinal study of home temperatures, comfort and health in the elderly which she hopes to use to improve understanding of older people’s comfort and health, enabling the elderly to live longer and healthier lives in their own homes. Her public engagement work has included working closely with those target audiences to gauge feedback and share findings. Annaleise’s PhD explores young people's experiences of health inequalities in disadvantaged communities living in Swindon and has included collaborating with local agencies on innovative, youth-led research. This has involved Annaleise collaborating with children’s services and voluntary organisations to facilitate three ‘action’ projects with young people. She has worked together with them to photograph, film and narrate their experiences of living in Swindon. All presentations impressed the audience, but Bethan’s stood out to judges who took this year’s Postgraduate Prize. 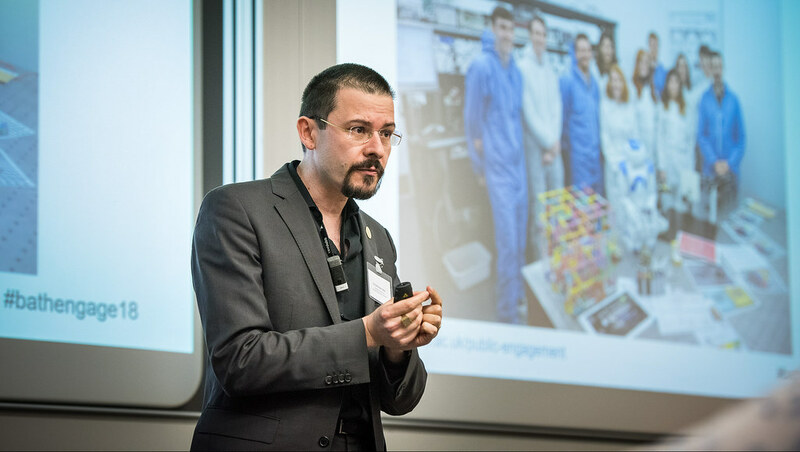 Dr Ventsislav Valev from the Department of Physics was awarded this year’s Vice-Chancellor’s Award for Public Engagement with Research. Ventsi’s work focuses on the interactions between light and new chiral nanomaterials. These emerging materials are creating opportunities to expand the use of light for chiral sensing, chiral separation and chiral synthesis — all vital functions for modern biochemistry and pharmaceuticals. As part of his public engagement, Ventsi takes complex science and translates this to help inspire the next generation through extensive outreach work at local primary schools. Judges were impressed by his enthusiastic presentation and for the ways in which he has used public tools to inform his research. Hear more from Ventsi on why he does public engagement. Vice-Chancellor Award for Public Engagement with Research 2018 from University of Bath on Vimeo.